Here are the latest numbers from Intrade. They view Erika Van Pelt as the least likely to win. Just a note: Dialidol currently has Scotty whooping Lauren, 20.5 to 12.5 on their own scaling. I don’t know if it’s obvious or not, but the way Dialidol works makes it far, far more reliable as the race moves to fewer people. I have always regretted not taking the time to take this into account in the model. The fact that Dialidol has never been wrong in the Finale is almost certainly not a coincidence. If they show Scotty winning by that much, the deal is almost certainly sealed. Polling results for President don’t move much after the first week of October. This is not surprising: by then, since the campaign has been going on for at least 6 months (usually more like 18 months), people have made up their mind. The individual gaffes, debate performance, and stump speeches, cease making that much of a difference. About the only thing a candidate can do is focus on his Get Out The Vote efforts and hope for the best. I wonder if the same thing isn’t going on with American Idol in the Top 5 until the finale. 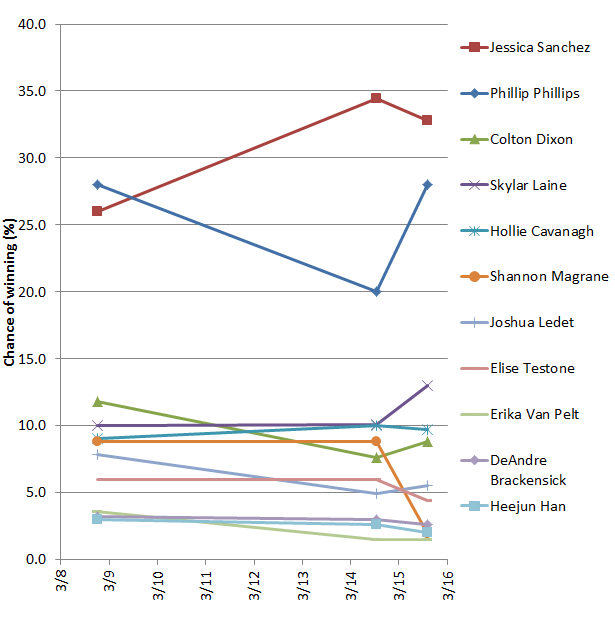 Season 4: Scott Savol came in with a dismal prior average of 22.7 in the approval ratings, but scored a 41 that week, above Anthony Federov and not far behind Vonzell Solomon. But he was eliminated anyway. Season 7: Brooke White did much better than her previous score of 27.7, scoring a 39.5, which was better than Jason Castro and David Archuleta. But she was eliminated anyway. The same can be said about RJ Helton in season 1 and Trenyce in season 2. That’s about half of all years (season 6 had no Top 5). The rest of the people scored the lowest and were eliminated. When half of the contests show no correspondence to the data, you know you have yourself a variable that isn’t correlated at all. What I believe is happening is that people have more or less picked their favorites by the Top 5. Prior score for the past 3 rounds matters because that’s when people were still picking their favorite. But by now they have one. Now, the difference to the presidential election is that as we go on, certain contestants are being eliminated. We could then hypothesize about where the votes for the contestant who left are distributed. Likely a fair number are just lost, as the people who liked that person stop voting. But some of them go to someone else. Who thinks Casey fans are going to vote for Lauren Alaina? Not me. I bet they will go to Haley Reinhart. 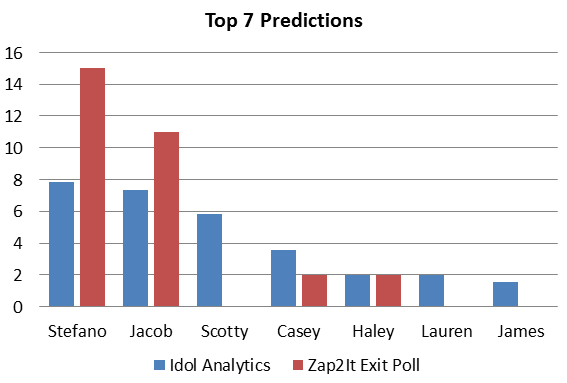 The Zap2It Exit Poll predicts Stefano to be voted off, with Jacob in a close second. 15 people voted for Stefano, with only 11 for Jacob, and 0 for Scotty McCreery. I don’t know that I agree with this. Two people each voted for Casey and Haley, in roughly the proportion I would expect. Casey and Haley are not crazy choices, and if 2 out of 30 voted for them, I’d think that was perfectly sane. So by now everyone knows what went down last night; Pia was voted off. What on earth do y’all suppose that was all about? So what do you think just happened there?